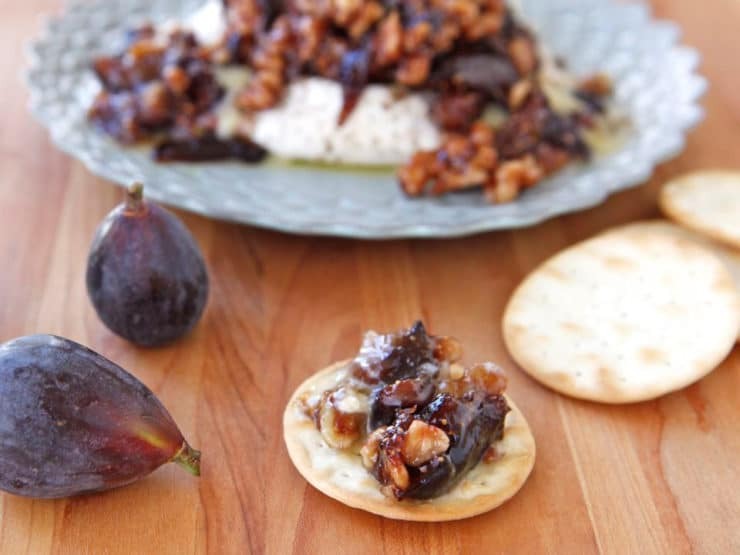 This fig and cheese appetizer recipe was inspired by our recent summer road trip. While traveling through Northern California we took a day trip through Marin County, a beautiful stretch of land just over the Golden Gate Bridge from San Francisco. I’d been wanting to see where many of the organic products I buy on a regular basis come from. Marin County is home to several small independent farms, including many farms in the Organic Valley cooperative. I regularly buy Organic Valley products, so it was a treat for me to drive by the family-run dairies where the milk originates. 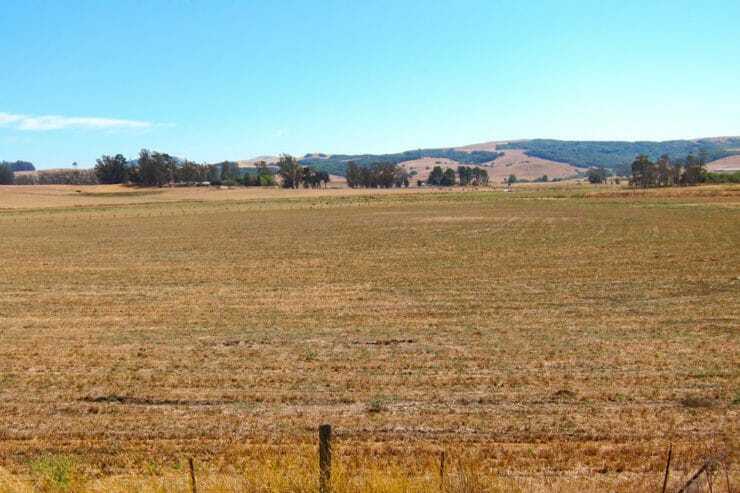 The land is clean and unspoiled, with large stretches of undeveloped fields that seem to go on for days. It was a lovely drive and a beautiful day, with perfect weather– warm, with a light breeze. Earlier that week, I had scheduled a tour with Cowgirl Creamery, a small organic cheese producer affiliated with Straus Organic Creamery. 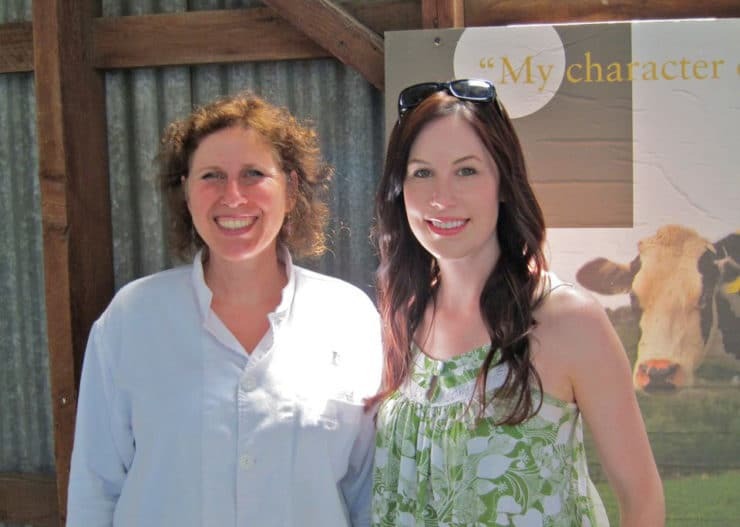 Straus was the first 100% organic-certified dairy in the United States. Their cheeses are available occasionally in our local Whole Foods, and at some small artisan cheese shops in Southern California. I’ve bought them in the past– they’re pricey, but fabulous. The Mt. Tam is my husband’s favorite; it’s similar to a brie cheese, with a mellow, earthy, buttery flavor. When Cowgirl Creamery cheeses arrive at the Whole Foods in my neighborhood they tend to sell out quickly, despite the high price tag. The quality is outstanding. 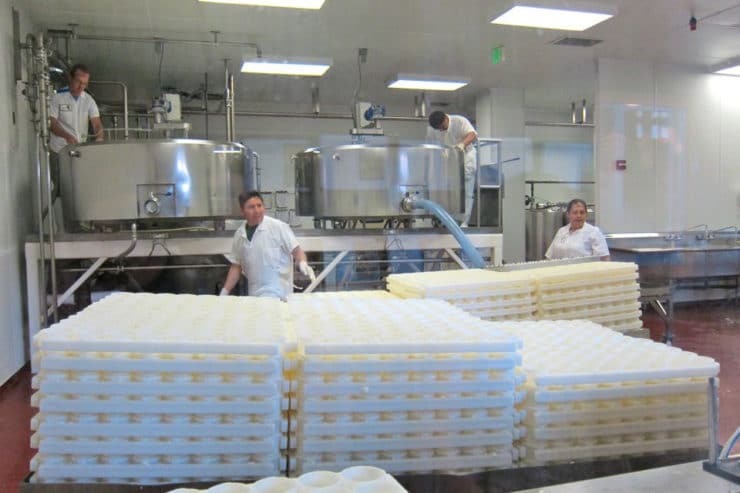 The creamery gives tours at two locations – one in Petaluma, and one in Pt. Reyes Station. When booking the tour, our lines somehow crossed, and I thought we were supposed to go to Pt. Reyes. This tiny town is kind of in the middle of nowhere, but it’s absolutely lovely… almost as though it’s been caught in a time capsule from the 40’s or 50’s. The buildings are rustic and vintage-looking, the signs are hand painted, and the people are friendly. The original creamery is located in an old restored barn, at a place called Tomales Bay Foods. 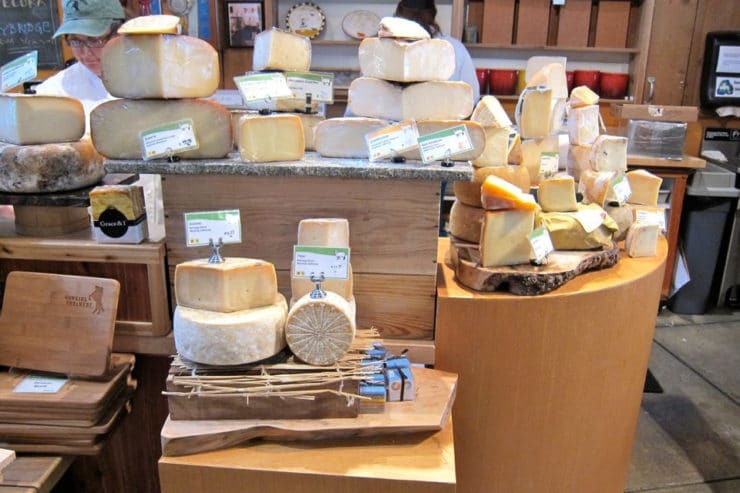 The shop features cheese and artisan food products from many of Marin County’s small, independently owned farms. My husband and I are cheese freaks… we love the stuff… and this place had so many varieties, we didn’t know which one to sample first. We could have spent hours there. Alas, all too soon, we realized we were in the wrong place. The tour was about 20 minutes from Pt. Reyes, in another town called Petaluma. We hopped back into our Jeep and made our way to the other creamery location. After getting turned around a bit we managed to find Cowgirl Creamery and our tour guide, Vivien Straus. Vivien’s brother runs the Straus Family Creamery. She began working part time with Cowgirl Creamery a few years ago, helping them give tours and dealing with public relations. She walked us through the creamery, showing us how the cheese is made step-by-step. After giving us a demonstration on how to culture and ripen the cheese, we were able to see the cheesemakers in action. As we walked through the plant, Vivien told us that a large part of their business comes from restaurants– chefs love using the cheese to enhance their dishes. At the end of the tour, we were offered a tasting of Cowgirl Creamery cheeses, including their famous Mt. Tam. It was a tasty way to end the tour, and it left me with cheese on the brain for the rest of the trip! 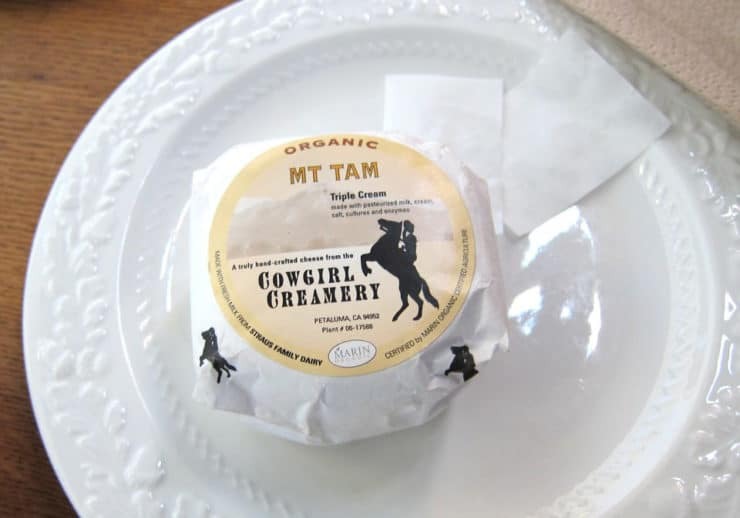 As soon as we returned from our vacation, I started keeping my eyes open for Cowgirl Creamery’s Mt. Tam cheese. After a couple of weeks, I was able to snag some from Whole Foods. I used it to whip up an appetizer that I’ve made in the past, inspired by this recipe on AllRecipes.com. I first made it for a party a few years ago, and loved it so much that I began serving it occasionally at family gatherings. Over the years I’ve adapted the recipe quite a bit, increasing the amount of figs, decreasing the amount of sugar, and exchanging walnuts for almonds. A more recent adaptation I made was adding a splash of amaretto at the end of cooking the syrup, which gives the figs a nutty, aromatic depth. I had a feeling that the fig recipe would be well suited to Cowgirl Creamery’s Mt. Tam cheese, and I was right! 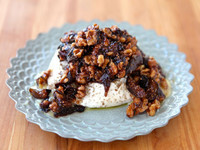 The sweet syrupy figs and chopped toasted walnuts were a perfect compliment to the creamy, half-melted cheese. Served with water crackers, it’s an amazing appetizer that will totally wow your guests. 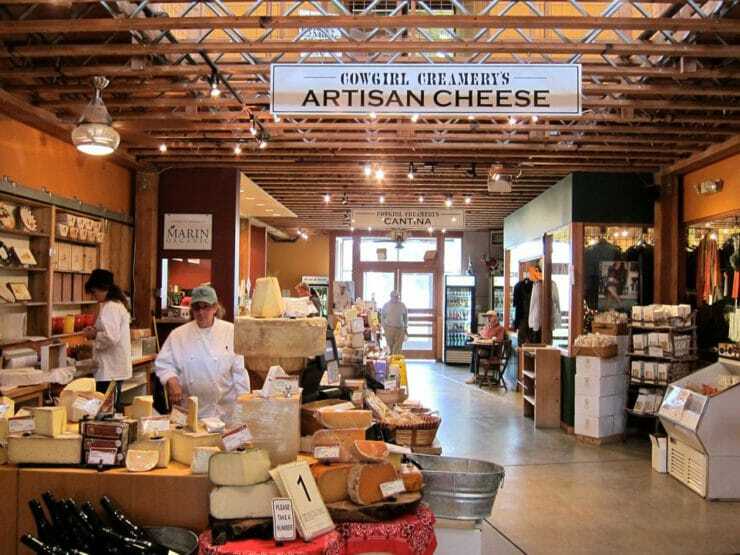 Cowgirl Creamery cheeses are not kosher certified, but most of their cheeses are made with Straus Creamery milk, which is certified KSA (their seasonal cheeses are made with milk from another creamery). If you’re looking for a hechsher, you won’t find it on Cowgirl’s cheeses. However, you can make this recipe with any wheel of brie cheese, so feel free to sub any brand you like. Fresh fig syrup, toasted nuts, and creamy soft-ripened cheese… how can you go wrong? This is one of those simple genius recipes that I bet you’ll be making for years to come. 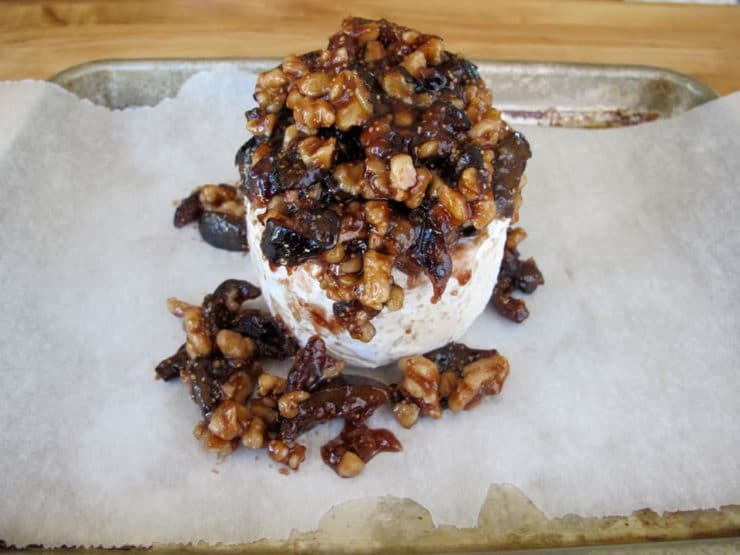 Seasonal cheese and fig appetizer - farm gooey soft-ripened brie or Mt. Tam cheese topped with warm sugary fig sauce and toasted nuts. 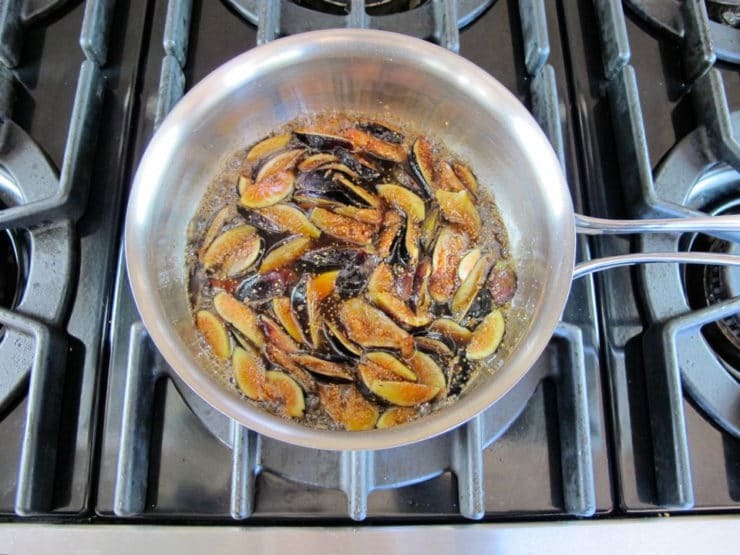 Preheat oven to 325 degrees F. Stem the figs and cut them into eighths, making long, slender slices. Combine the brown sugar and water in a small saucepan. Stir over medium heat till sugar is dissolved and the mixture bubbles around the edges. Stir in the fig slices, making sure they're evenly coated with sugar water. 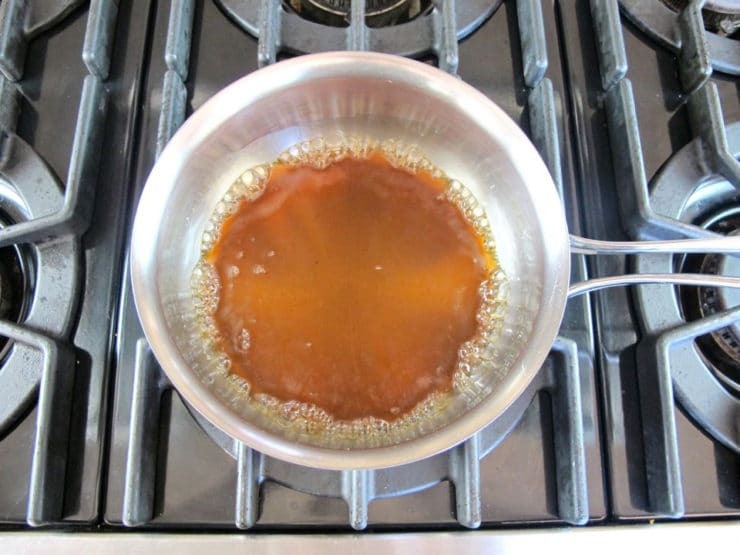 Let the mixture simmer between medium/medium low for 10 minutes till a thick, rich syrup forms. 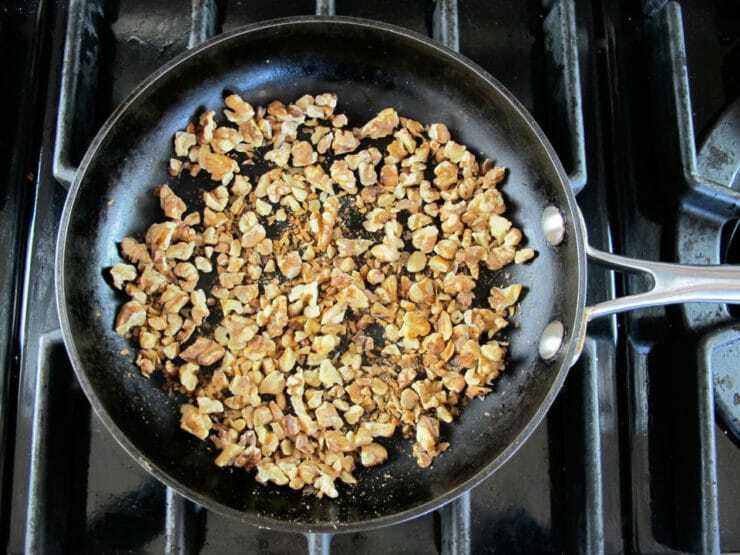 Meanwhile, spread the chopped nuts out into a small skillet. Heat over medium, stirring frequently, till the nuts are toasted. Remove from heat and reserve. 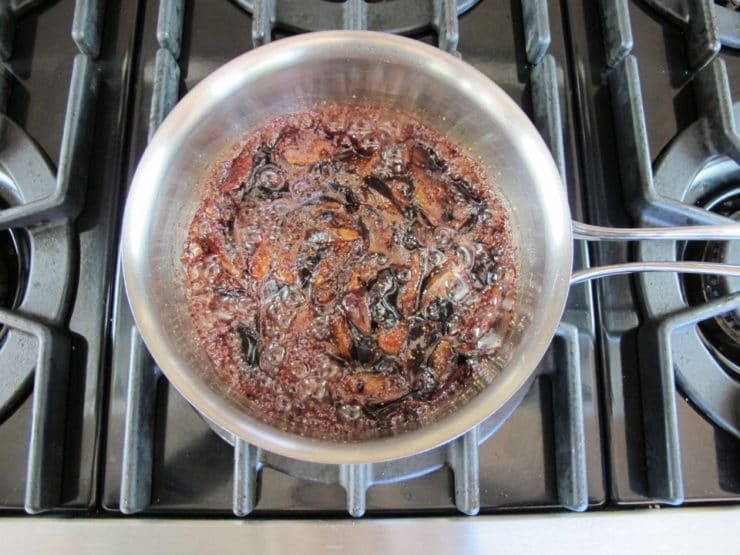 When over half of the liquid has reduced and the fig syrup is thick, remove from heat. 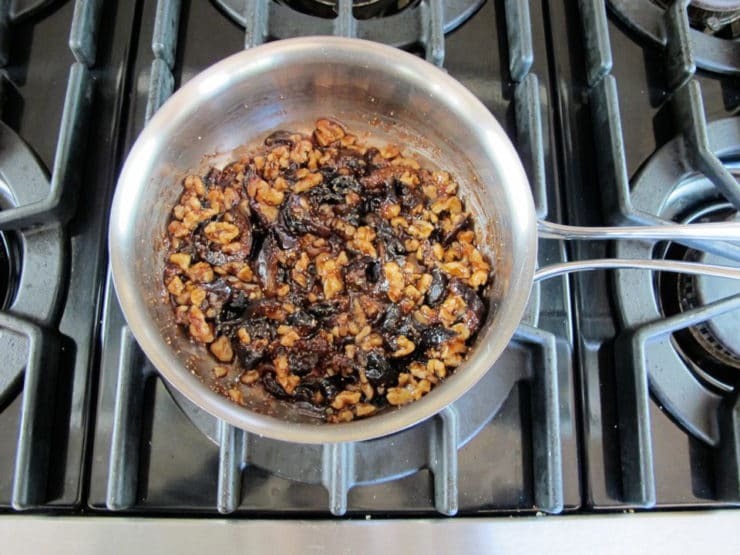 Stir in the amaretto, vanilla, and toasted walnuts. 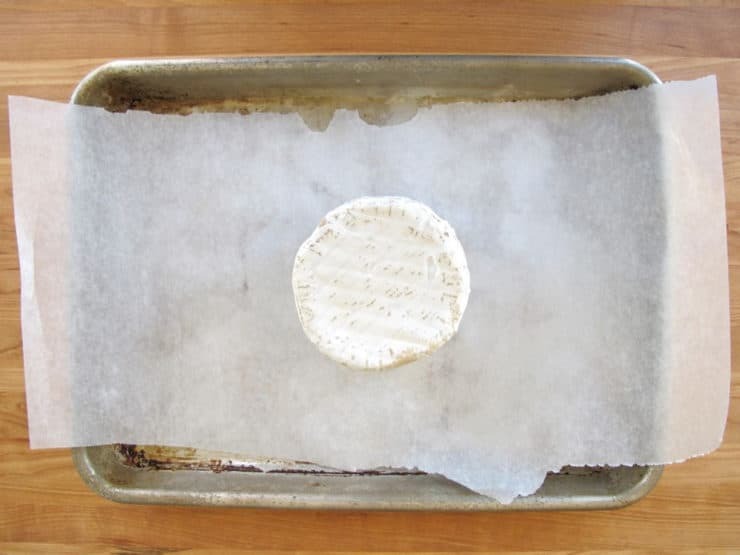 Place the cheese on a small parchment-lined baking sheet. Scoop the fig and nut mixture over the top of the cheese, letting it fall around the edges. Place the cheese into the oven and let it warm up for about 10 minutes, till softened and warm but not melted. Keep a close eye-- it can go from warm to melted in a few seconds. I left mine a little too long, and the cheese melted and gooped out a bit... no big deal, though, it was still amazingly tasty. Serve the warm cheese and fig spread on water crackers or small baguette slices. My neighbors figs+my mom’s pecans+your recipe provided me with a praline type taste. I did add some extra salt and vanilla. I’m going to try it in the freezer see how it does. Thank you for the inspiration, delicious! Me and my husband loved this delicious recipe. It was easy following the pictures. I wondering if I use dry figs the result will be good as with the fresh ones? That looks sinfully delicious, beautiful photos! I like to top brie with fig jam, wrap in puff pastry and bake until golden. This looks even better! Since figs are not readily available here is there another fruit that can be used…? You had me at cheese and fig 🙂 Awesome post about the creamery. Looks like you had a lot of fun. I had a flat of figs that were on the peak of ripeness and needed to be used quickly. I made this tonight and substituted the walnuts with hazelnuts. Mmmmmm….. this was SO good! This looks and sounds fantastic! I will make it for Rosh Hashanah. Do you think I can make the topping ahead of time? Should I remove the rind from the Brie before baking? Hi Nora! Yes, you can make the fig sauce ahead, just keep it slightly more liquid– don’t reduce it too much. Store it in the refrigerator, but bring it to room temperature before baking. Do not remove the rind– it will hold the cheese together, it will melt too quickly otherwise. Enjoy! I have a shwack(sp?) of figs. I made a fig pizza, today I’m making a fig tart, and to use the last of my figs I’m going to make this Fig spread. Perfect! this looks divine!! i will be referencing this on my blog soon for sure! I will be going with some friends to Cowgirl Creamery next week – and this post has made me even more excited than I was before to go! 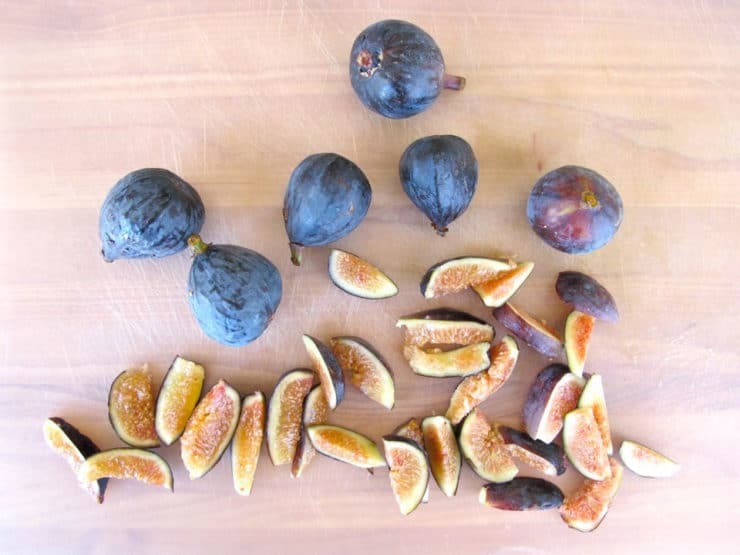 Your recipe looks great – I love figs. I’ll have to give this one a try. Love your blog…found you through the Kitchn. yum..yum.. want to reach out and grab a bite! So innovative.